Easter Sunday has come and gone with its glorious splendor. It was a wonderful day of worship and family. Neal and I had the pleasure of taking Hays to pick out his clothes for the day several weeks ago, and he did a great job of selecting a beautiful pink tie to go with his outfit. I made Amelia’s dress. It was a long process as I had challenged myself to make the dress from a special pattern. The pattern is Chery Williams Antique Lace Dress and requires yards and yards of lace. Chery and I went to high school together so making the dress she designed was a special endeavor. 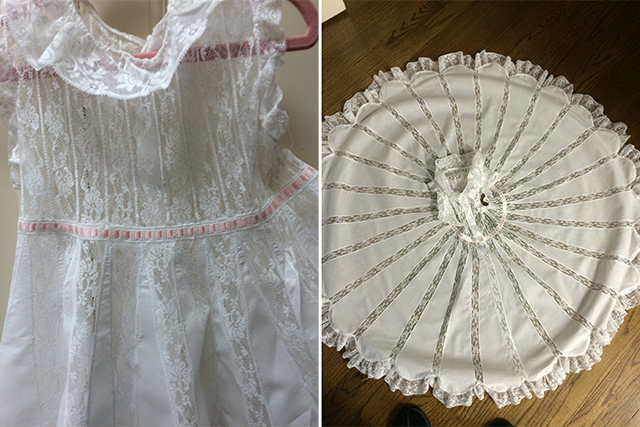 I painstakingly pieced the fabric and lace panels—and more lace, then more lace, then finished with lace. When I was finished (the Saturday before Easter) I pressed it perfectly and delivered it. Amelia was not home so I didn’t see the dress on her until Sunday when our family gathered after church. When she walked in, I just glowed thinking of the hours of stitching that lead to this pinnacle moment: photo time! We all got out our cameras/smart phones and snapped photos. It was just as I had imagined. I realized in a quick moment that all of my work was summed up into this one statement: “Gigi, it is the perfect twirling dress!” Amelia said with delight as she spun around with the biggest smile ever. Perfection. All of my work was well worth it. Sewing is one of my favorite hobbies. My mom made all of my clothes and taught me how to sew. For that I am very thankful. How many of you all sew? You brought back memories of my favorite person in the world. My Auntie May. She made dresses for me and my sister for years. Lace dresses with long ribbons in the back to tie into a beautiful bow. Only she could tie that bow so that it would stay all puffy for the whole day. She also made all of our costumes for our dance recitals. It was a very sad day when I was told that she had passed away. She also made clothes for our dolls so we could all match. Thanks for the memories. I sewed many items of clothing for my daughter and continued with her daughter. My granddaughter is now a senior in high school. It gives me great pleasure to look in her closet and seen all the items I sewed for her, hanging there. Thanks so much for sharing the beautiful lace dress you made for your granddaughter. Thank you for sharing this beautiful creation. The children beam with contentment from being so loved. Let us pray that all children know love and the safety and contentment love brings. What a lovely dress!! It is a work of love. My mother sewed dresses for me and I began sewing at age 10. I made Christmas and Easter dresses for my two daughters. When they were in high school and college I made their prom dresses and ball gowns. We still have all 26 gowns stored in a closet. What wonderful memories they bring. Nothing better than a little girl in a twirly dress. It is so beautiful. I hope it becomes an heirloom. She will treasure this always! The lace dress is truly a work of art! Your children are beautiful, and the dress is divine. It is a true labor of love. I think if we didn’t sew, that beautiful lace creation would make us want to learn to sew! Just beautiful! Hoping she will treasure it and it will get kept long after she can’t wear it anymore. When my niece (now 16, going on 60) was little, I used to make her the most beautiful church clothes. (I learned to sew at a very early age from my Mom who was a professional seamstress!) Her Mom has kept all of the little dresses and I can only hope they will get worn by a new generation at some point! Especially that one with the embroidered lace sleeves that had to be removed and redesigned three times because they “Scratched me!” Keep up the beautiful work and I really enjoy the magazine and the beautiful and informative blogs! Amelia is beautiful and so is her dress. I love little girls with bare feet in beautiful dresses. Such a gorgeous dress. I too made dresses for my daughter and always with a full skirt until she got in high school and then she took over and made a lot of her own dresses. Your granddaughter looks so cute in that dress and we can tell she is very happy. Loved seeing your grandson all dressed up also. We had too boys and they always wore little suits with ties to church on Sunday. Always love reading your blog so glad that I joined this wonderful group. Oh, that is a beautiful little dress! I , too LOVE to sew, but find myself unable to find as much time to do it, as I used to be able! 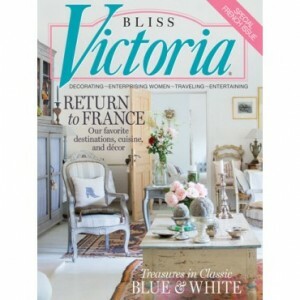 Perhaps you could include some more inspirational ideas in the Victoria Magazine! I know I would love it! 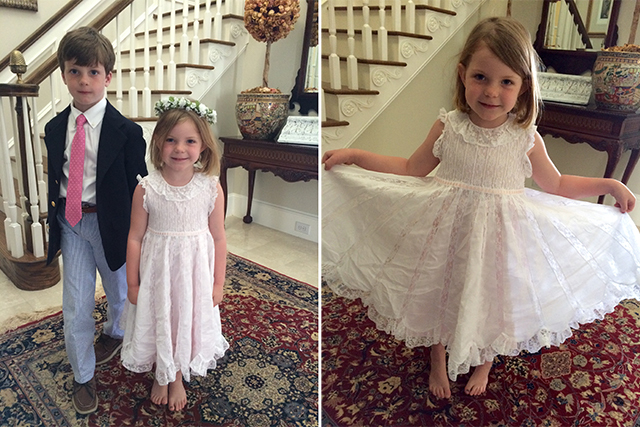 Wow, little girls and twirling just seem to go together – what a perfect dress & adorable grandchildren. Through circumstances we would not have chosen my husband & I sadly have no grandchildren so I am always glad to see & hear of others fun times with theirs. We too love family times with church, dressing up and beautiful dinners together such as this Easter and feel very blessed. My fifty some year old niece reminded me the other day that I had taught her to sew before she was 10! Phyllis the dress is exquisite!! I make heirloom dresses as well and know what a thrill it is to see them on your precious grandchild. Thanks for sharing your beautiful pictures. Like everyone here has said, the dress is lovely… you did a really nice job.. Hope it will be put away and kept for sometime to come..
Oh Phyllis!!! I love the dress! I have a little Amelia (and an Evelyn…a Noah and a Joshua). Unfortunately, their Yaya (me) does not sew a stitch!!! I only WISH I could!! But, thank you for sharing yet another picture of your handy work and BEAUTIFUL grandchildren. As you’ve seen before, I have special memories and such fun with mine, but this dress of Amelia’s…..and the others you’ve made….will be something she will always treasure…and NEVER forget. I’m also so happy that you keep the tradition of “special” dresses and suits for “special” days! We love to dress “for Easter….or Christmas…..or just Sunday”. I guess anytime family is together is special…. Thanks for again sharing yours!!! A twirling dress…amazing…..
What a beautiful little dress & a work of art! Incredibly beautiful, and I venture to predict that she will remember this dress forever and ever and how it felt to twirl in it. Brava! That dress is beautiful and Amelia is so cute! Unfortunately I don’t sew but my mother did…she made so many pretty things for me and my Barbie dolls too. Such a gift! This dress is beautiful!! I do not sew, but do appreciate those who do and all the work it takes to make something so very special. Thanks for sharing! Every girl does need a twirling dress! It is just magnificient! This is the most wonderful post! Your grandchildren are beautiful and Amelia’s dress is magnificent. I do not sew clothes, but I love to needlepoint. Every little girl needs a twirling dress and you created a perfect one! I agree with the comment above. I would love to have lunch with you. The dress is so beautiful! Perfect labor of love! It is for sure the perfect twirling dress! Both your grandchildren look absolutely adorable! Someone asked me recently if I could spend the day with anyone currently alive who,would you chose. I didn’t have to think about it. 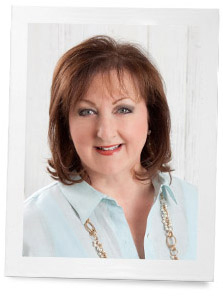 It would be Phyllis Hoffman Depiano of Hoffman Media. Seeing this lovely dress is just another reason why I would love to have lunch with you and talk about keeping beauty alive. Every girl needs a twirling dress! Beautiful work, Phyllis! You’ve done a beautiful job and we who do heirloom sewing will appreciate it as will most of our generation. I find the younger moms just look at it as another dress and toss it in the back of the closet. With 7 granddaughters I should have done a lot of sewing for them, but no one appreciates the work that goes into it and their mother’s prefer store bought clothes, so they look like the rest of the gang. We have an heirloom dress in my family. My mother made it for my sister, similar to this, with lace and inserts. My sister had her picture made in it, then me twelve years later. Then my sister’s daughters , granddaughters , great-granddaughters. I finally had two granddaughters who finally had their pictures made in it. I’ve lost count but we are probably approaching 20 little girls with their pictures being made in it! The dress is 71 years old, pale blue with off white lace and gorgeous! I so enjoyed seeing you beautiful dress for your granddaughter. Maybe you all will start a tradition with it! That is truly amazing…..wow I am so glad it was kept! What a beautiful dress and child. I have sewn for many years, making most of our daughter’s clothes as they grew. Then it was prom dresses and even a wedding dress, and then granddaughters. We now have a little great granddaughter whom I have done a little sewing for. Also to her, I am GiGi too. This is beautiful! A true labor of love! My mom was an amazing seamstress-I do not even hem! But I do appreciate the art! Just beautiful dress & grand daughter. I am 65 and made my grand daughter’s Easter dress. It was my first attempt at heirloom sewing combined with lace and machine embroidery cutwork designs. She is 2 1\2 so I hope I have a lot of these special times to sew for her in the future. There is nothing more special that a little girl in a dress with a lot of heart in it. You are quite amazing, thanks for sharing your beautiful photos! You out did yourself! Gorgeous and what an incredible heirloom now for the family. Such a beautiful dress! I am so glad that your long hours have been rewarded with such a nice comment! What a beautiful dress and beautiful model! I made two antique lace dresses this year for clients, so I can appreciate the time it took to create this for your grandaughter. It’s just beautiful! You do a wonderful job on anything you make but this is especially gorgeous. I know Amelia just loves it. Hays looks handsome, too. Amelia’s dress is absolutely stunning and it shows that it took a lot of work and love to make it, and she looks so adorable in it. I used to sew clothes for my dolls when I was a child growing up in Italy. I loved taking scraps of leftover material and creating one of a kind clothes for my dolls. Unfortunately as I grew up, I stopped sewing but I think about taking up this hobby again, hopefully in the near future. By the way, I’m a huge fan of Victoria Magazine and the Cottage Journal, I have been subscribing to both magazines for many years; as a matter of fact, I started subscribing to Victoria when it first came out in the 80’s. I particularly love the yearly French issue, as I have been to France a few times and the magazine takes me back to that gorgeous country that I can’t get enough of! Keep up the great work!.